Is Arkansas working on the stretch of Future I-49 from Doddridge and the Louisiana border? What number will the completed sections of I-49 in LA get? It won't be I-49 because the northernmost sections of the freeway are scheduled to be finished before the southernmost sections. Or will they reroute US 71 onto the freeway? According to the STIP, Phase III of that section is expected to bet let in 2012. I'm not sure what Phase III is referring to. I was just down that way in March and I didn't see anything that looked like LA 168 to the AR Line would be finished this Summer. I need to find some time to check it again. As far as Arkansas, some work is being done from the end of AR 549 to Miller Co Rd 4, but I haven't noticed anything south of that. A 30-mile section of I-49 North between La. 1 and Louisiana Highway 168 (Segments I through B) can be opened to traffic in late 2013. The remaining two-mile segment between La. 168 and Arkansas (Segment A) can be opened after that state finishes its remaining portion of I-49 North in 2015. Louisiana Urban I-49; Which City Will Be First? To facilitate discussion, I decided to start a topic instead of a poll. Lafayette I-49 Connector or Shreveport Inner-City Connector? (If anyone wants to make an argument for New Orleans from West Bank Expressway to I-310, please do so). For above reason, Lafayette is farther along in process than Shreveport and, for Shreveport "cons" outlined below, should have this advantage for many more years. Cons: Momentum for construction has slowed down as LADOTD has focused on I-49 North construction from I-220 to Arkansas state line. For same reason, construction of I-49 South as a whole has appeared to slow down. LADOTD may want to first focus on less expensive, piecemeal intersection upgrades to tranform U.S. 90 to I-49 South. Business and political leaders appear to agree on need for Inner-City Connector and have been seeking community involvement in the process (http://www.i49shreveport.com/community.php). Approximately 32 miles of 37 mile segment of I-49 North in Louisiana is scheduled to be completed by 2013 and Arkansas segment from Doddridge to LA state line should be finished by 2015 (http://www.shreveporttimes.com/article/20100725/OPINION03/7250364/30-miles-of-I-49-North-could-be-opened-in-late-2013). Assuming recently awarded contract in Texarkana from Arkansas Blvd. to I-30 is also completed by 2015, all but 5 miles will be completed from I-220 to I-30. All of which should put pressure on feds to seriously consider the project (complete I-49 from I-10 to I-30!). The 5 mile segment of I-49 North immediately north of I-220 (sections J and K) is currently unfunded and will be expensive. Presumably, LADOTD would want to complete these sections before considering the Inner-City Connector, which will consume many years. I-220 to LA 3132 to I-49 south of Shreveport could already be considered "missing link" easily resigned as I-49 and feds might question necessity for project. I am not from Louisiana and I do not know the local politics. That said, I think Shreveport Inner-City Connector will be built first. Re: Louisiana Urban I-49; Which City Will Be First? Well....I'm a Louisiana native and have followed the I-49 projects for the past 20 or so years, so I'll take a crack at it. No brainer: After I-49 North is finished between I-220 and Arkansas, THIS MUST BE LaDOTD'S HIGHEST PRIORITY. Considering that much of US 90 between New Iberia and Wax Lake is nearing completion to Interstate standards -- only two at-grade intersections (LA 308 near Four Corners and LA 182 at Calumet) need to be converted to interchanges, and only some spot frontage road construction is needed between LA 88 and LA 675) -- that would leave only the Lafayette segments and the segment between Wax Lake and Berwick/Morgan City to be constructed before we have a legit Interstate between Lafayette and Raceland. ROW is being slowly acquired in Lafayette proper for the I-49 Connector project....but the emphasis is on S-L-O-W-L-Y. Right now, they are awaiting the results of a study on the amount of spacing between the elevated structures of the proposed freeway within Lafayette proper; that has become a major sticking point between the local authorities and the LaDOTD during the design process. It is possible that any additional ROW may require a supplemental environmental study, which would further delay construction...but as always, the big drawback is MONEY. It would cost nearly $400 million to construct I-49 through Lafayette, and that doesn't include the additional $350 mil that would be needed to upgrade the segment of US 90 immediately south to the LA 88 interchange. For all that, I still say that LaDOTD should bite the bullet and fund the Lafayette-Morgan City upgrade post haste as the #1 priority...if not for the need for rapid hurricane evacuation of the cities along that corridor, than definitely for the benefits to the oil industry dependent communities along that corridor. The second priority should be to complete the Westbank Expressway upgrade all the way to US 90 and rebuild the WBX/90 interchange to tie into the Huey P. Long Bridge rebuild....perhaps with some upgrade of existing US 90 through Avondale. The remaining segments of US 90/proposed I-49 South can be delayed a bit until proper financing is obtained...though having a decent connection from Raceland to I-310 which would allow use of the latter as a stop-gap would be a nice langiappe. The LaDOTD just complete a Phase 0 Feasibility Study on the possibility of closing the gap between I-20 and I-220 via a downtown connector freeway, and thus far public response has been suprisingly positive. Even many in the communities who were the most opposed during the 1980's to running I-49 through downtown have had a change of heart...mostly due to the potential economic growth impacts and neighborhood rehab possibilities. Yes, I-220/LA 3132 do exist as a bypass alternative...but locals have expressed major concerns that that route would require serious widening to 6 lanes to handle the potential through traffic, and that such would also remove traffic from the central downtown area. More importantly, I-220 crosses Cross Lake, which serves as Shreveport's main source of drinking water; and there are major concerns about having major trucks and hazardous materials using that route. Also...LaDOTD did think ahead of themselves and incorporate into the I-49/I-220 interchange ROW for a future extension southward..so they must favor a more direct through route as well. I'm guessing that once the remainding funds for I-49 north of 220 are secured and construction is completed, they will find some way to fund the Inner City Connector. There may still be some who would prefer the I-220/Inner Loop corridor and who would oppose the downtown route on NIMBY principles...but they would be in the minority this time. Now...anyone here has about $2 BILLION to spare so that we can get both projects going??? Just received an email reply from LaDOTD re completion of Sections A and B of I-49 North. No driving on either one of them (Section A makes sense because it ends right at Arkansas state line; Section B ) for a long time. Intervening time between completion and opening to traffic provides opportunity to hike a piece of interstate before driving on it. Anyone ever done that? Section A of I-49 North (from La. 168 to the Arkansas line) will be completed by October 2010, and Section B (from Mira-Myrtis Road to La. 168) is estimated to be completed by March 2011. These segments will not be open to motorists until other segments have been completed, possibly in 2013. We are currently discussing options for ribbon cutting/ groundbreaking ceremonies for I-49 North segments. I have looked at the construction plans for all the I-49 jobs in Louisiana which have plans available, and all of the lengths involved (according to the signing plans) are to be signed as I-49. It also has the potential to be an illegal drag strip. a few strategically placed Jersey barriers will leave it open to pedestrians but closed to John Force. I-49 South should be the top national priortiy as of right now for Federal Highway funding. If America wants New Orleans to remain a major city with a large population. Then New Orleans and Southern Louisana need a top notch Interstate to move people and move them quickly from oncoming Hurricane's path. Luckily America and Louisana actually didn't get a full blow from Katrina and it was weaking upon landing. Next time we might not be so lucky and the death rates will be higher if the current transportation situation remains in the New Orleans and Southern Louisana area. Any bets as to when these projects will actually be let? I-49 South should be the top national priortiy as of right now for Federal Highway funding. Disagree. Repairing and improving what we already have (starting with I-10) should be the top national priority. Period. What good is building new roads if we let our existing roads fall apart? Yeah, NoLa really was let off the hook when it came to Katrina. And all those people who couldn't leave the city because of their lack of a personal vehicle will certainly be able to use new 49 in the future. It was. See Galveston, 1900 for approximate effect of a direct hit. At the risk of going OT, NOLA has been a redheaded stepchild for many years. Was it 1965 they got hammered by a bad hurricane and decided to build better barriers, but when Katrina hit, the barriers still weren't finished... Uncle Sam kept diverting money to other projects. There was a big discussion on Talk of the Nation today. But even if 49 isn't completed to NOLA, maybe they can at least upgrade the non-expressway segments along US 90. That would still be better than what they have now. First off, US 90 between Lafayette and New Orleans IS an existing road that has been already upgraded to Interstate standards for most of its distance. Completing the upgrade (along with improving existing Interstate highways like I-10, I-20, I-55, etc.) should be a high priority. Secondly, the state already has a maintanence program for repairing and upgrading their existing highways. Third...if we took the "only improve the existing highways we have" approach, we wouldn't even have I-49 between Lafayette and Shreveport, since four-laning the existing highways would have been less costly. I understand that money is an issue, but you just can't stand pat while needs grow. Actually, I-49 South would be far more valuable for hurricane evacualtion for most of the towns in South Louisiana such as Morgan City/Houma/Thibodeaux, Franklin, Baldwin, Patterson/Bayou Vista, Jeanerette, and New Iberia, than it would be for NOLA. I-10/I-55 and I-59 (and to a lesser extent the Ponchatrain Causeway) are the main evac routes for NOLA; using US 90 would be a bit of a reach for NOLA residents since they would be doubling back..not to mention fighting with evacuees from other cities along that corridor. And yes, because Katrina did go slightly east of the city, its winds didn't do much harm..but the storm surge dumping all that water onto Lake Ponchatrain and ultimately onto the Southshore areas was more than enough of a calamity, as the levee breaches clearly showed. Also, Katrina wasn't the 175 mph monster that it had been in the open Gulf of Mexico by the time it passed through LA/MS; it had died down to a still respectably dangerous 130 mph once it got abeam of NOLA. Slidell and the MS coast still got smacked pretty good wind-wise, though. The format is also typical of LaDOTD signing plans in general. I am sorry to say that they generally do not produce good signing plans. 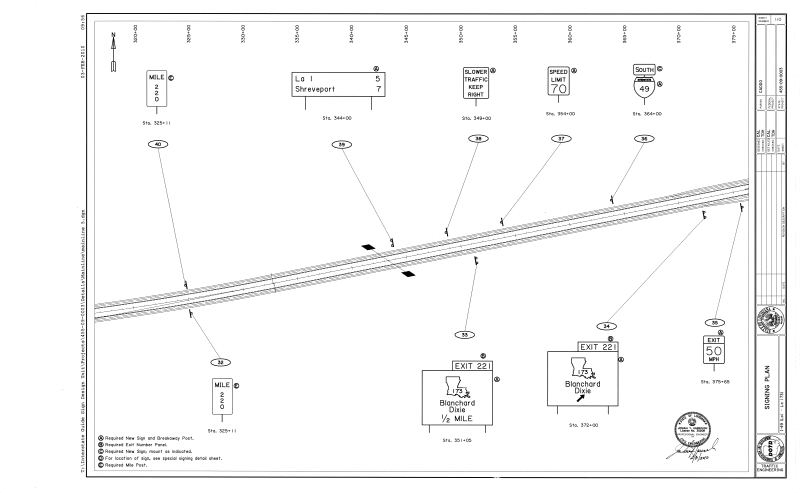 LaDOTD does not do sign design sheets, period, and it is rare for sign layout sheets to be pattern-accurate, although LaDOTD did this a few years ago for (among other projects) a sign rehabilitation contract on the existing length of I-49. In terms of the scheduling of future I-49 contracts, plans are currently available for 455-09-0006 and 455-09-0011, but not 455-09-0005. My guess is that the three contracts will be let individually, without ties or "A + B" bidding arrangements, because the individual contracts are all fairly large and, since the relevant lengths of I-49 are being built substantially on new location, there is limited scope for scale economies through consolidation of traffic management. And I'll raise you the Mississippi gulf coast after Camille in 1969, the last time a hurricane at cat 5 hit the US shore.